Though his popularity lasted less than a decade, Felix the Cat remains one of the seminal figures in pre-sound animation. The mischievous, clever cat appeared in over 150 animated shorts throughout the 1920s, many of which served to influence an entire generation of animators to come. By every definition of the word, Felix was an original; as Jerry Beck points out in his book The 50 Greatest Cartoons, Felix was the first unique animated star to be created specifically for the screen. He wasn’t plucked from the funny pages or based on broad caricature–Felix was a true original character, and audiences responded enthusiastically to his zany adventures. He didn’t start out as “Felix.” The character was first introduced in a 1919 cartoon short called Feline Follies, going by the name “Master Tom.” In this short, Master Tom, a resident of Pussyville (I can’t make this stuff up), falls in love with Miss Kitty White, and shenanigans ensue. The early “Felix” hallmarks are here in this initial version of the character, most notably the cat’s ever-morphing tail: at one point it becomes a question mark to indicate Tom’s puzzlement, at another, a makeshift toothbrush. 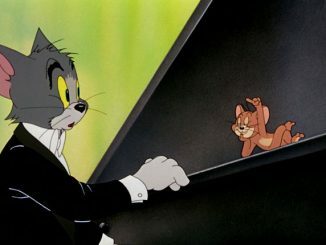 The character remained “Tom” in his next short, Musical Mews, released a mere week later, but less than a month later, he was rechristened “Felix” and the cartoons took off in earnest. It’s unclear how the cat came to be known as Felix, which is not surprising given the murky origins of the character himself. The two men behind its creation, Australian producer/animatior Pat Sullivan, and American animator Otto Messmer, both claimed credit for Felix. Sullivan’s self-named studio produced the cartoons; as such, his name was the one that appeared on the title cards, and he owned the copyright to the character. Several years after Sullivan died in 1933, however, Messmer asserted that he was the one who had actually created Felix. The dispute continues even today, though it seems a majority of animation scholars now credit Messmer as the mastermind behind the cat. Still, Sullivan’s influence on the character’s popularity cannot be denied, as his aggressive marketing of Felix resulted in a boom of merchandise ranging from stuffed toys and figurines to clocks, making the cat one of the most recognizable stars in American film at the time. Indeed, at the height of his fame, Felix the Cat rivaled his human cinematic counterpoints in popularity. Along with Buster Keaton and Charlie Chaplin, Felix became a stalwart of 1920s comedy. 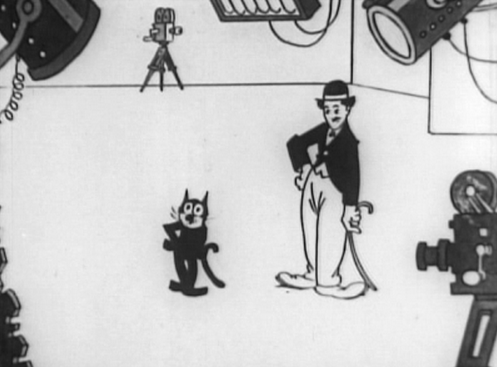 In fact, Felix was largely based on the latter comedian; as Messmer once explained, in creating the cat, he “used the style of Charlie Chaplin and kept him alone in his antics, unhampered by supporting characters. Being a loner, he could roam to various locations, without being limited to any fixed place.” Certainly the influence of Chaplin on the characterization of the cat is undeniable. Felix, much like Chaplin’s famed Little Tramp, is quite often a victim of circumstance, finding himself in strange situations in which he must rely on his instincts and innate cleverness to escape trouble. Felix in Hollywood practically pioneered the idea of inserting Hollywood cameos into cartoons, something that was revisited often in later years by other animation studios including Disney and Warner Bros. Other stars who are caricatured in this short include Gloria Swanson (who becomes the subject of Felix’s leering gaze through the keyhole of her dressing room), Ben Turpin, Douglas Fairbanks, and William S. Hart. Even notorious film censor Will Hays, newly installed at the time as the first president of the Motion Picture Producers and Distributors of America (now the MPAA), makes an appearance. And in the end, it’s legendary director Cecil B. DeMille who makes Felix’s Hollywood dream come true, handing the feisty feline his very own contract. Felix in Hollywood may be best remembered for its depiction of silent-era film stars, but a combination of clever gags and inventive animation provides the true backbone for the cartoon: a gum-covered street results in a boon for a local shoe shop (and for Felix); the cat contorts his body into a makeshift satchel to fool his mean owner; a mosquito “stares daggers” at Felix, at which the cat plucks one of the daggers from midair and wields it like a sword against the bloodsucker. Even when the “stars” are not onscreen, Felix’s antics remain entertaining as ever. 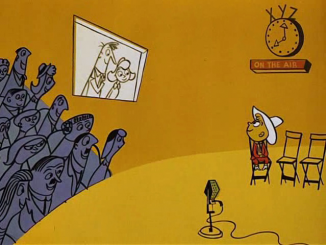 In recent years, this cartoon has been recognized as the pinnacle of the Felix series, earning a spot on Beck’s “50 Greatest Cartoons” list (at #50, it is the only Felix short to make an appearance). While the series continued throughout the decade, Felix’s popularity ultimately waned as sound cartoons emerged. The character, so adept at pantomime, simply did not adapt well to the new medium. After a dozen sound shorts were produced, Felix was retired. 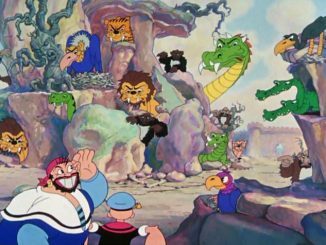 Though a sound-and-color revival was attempted in 1936 (without the input of Sullivan, who had since died, or Messmer, who declined to participate), it lasted only three cartoons. In the meantime, the character remained popular in a regular newspaper comic strip and a series of comic books (drawn mainly by Messmer), and eventually found new life on television in the late 1950s/early 1960s. Another revival was attempted in the late 1980s, resulting in an ill-advised, poorly-animated feature film, Felix the Cat: The Movie (1991), and another television series, The Twisted Tales of Felix the Cat, in the mid-1990s. 50 Greatest: #50 “Felix in Hollywood” | A Jubilation!